As of the summer of 2002, Dan Haerle retired from full-time teaching. He was a faculty member in the Jazz Studies Division of the College of Music at the University of North Texas for 25 years (Regents Professor for the last 10 years). He taught Jazz Piano, Jazz Fundamentals, Advanced Jazz Improvisation, Jazz MIDI, Graduate Jazz Improvisation, Rhythm Section Master Class and he supervised the jazz chamber music program. He directed the Jazz Strings and a keyboard ensemble called The Zebras. He taught the courses in basic MIDI theory, sequencing and jazz notation. He has recorded many Jamey Aebersold Play-A-Longs, has several jazz text books published, is an active jazz clinician nationally and internationally and has had a great deal of performing experience. Dan currently is on modified service at UNT and teaches an on-line jazz theory course which he developed while on sabbatical in the spring of 2000. He is available for residencies and concerts with his trio. • 1977-2002. University of North Texas Denton, Texas - Professor of Music. Appointed Regents Professor in 1992. Taught jazz theory, jazz piano, jazz improvisation, jazz MIDI and was the supervisor of jazz chamber music (small groups). • 1975-1977 Arizona State University Tempe, Arizona - Associate Professor of Music. Co-director of Jazz Studies degree program. 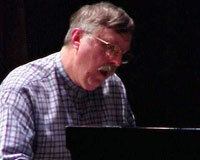 Taught jazz piano, jazz improvisation, jazz history, jazz styles and directed jazz ensembles. • 1971-1973 University of Miami Coral Gables, Florida - Assistant Professor of Music. Taught classical theory, jazz piano, jazz improvisation, jazz history, jazz arranging and directed jazz ensembles. • 1968-1971 Monterey Peninsula College Monterey, California - Instructor of Music. Taught class piano, music theory, jazz history, jazz improvisation, and directed jazz ensembles. • 1966-1968 Kansas State University Manhattan, Kansas - Assistant Professor of Music. Taught freshman and sophomore theory. • 1961-1963 Tri-County Community Schools What Cheer, Iowa. Instrumental music director for elementary, junior high and high school. • Born in Quincy, Illinois in 1937. Attended Madison school and Quincy High School. In 1953, moved to New York, attended Flushing High School (junior year) and graduated from Hicksville High School in 1955. In 1957, he moved to Cedar Rapids, Iowa where he attended Coe College and graduated in 1961.